Sue Bourne's acclaimed dance documentary is planned for Blu-ray next month. In an early announcement to retailers, Screen Media Films will release 'Jig' for Blu-ray on October 4. 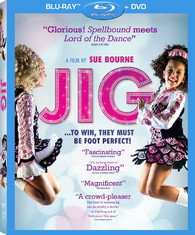 'Jig' is the remarkable story of the 40thIrish Dancing World Championships, held in Glasgow, Scotland. This feature length documentary gives viewers unprecedented access to the little known world of competitive Irish Dancing. Thousands of dancers and their families and teachers from around the globe descend upon Glasgow for one drama-filled week. Clad in wigs, make up, fake tans, diamonds, and dresses costing thousands of dollars, these ambitious dancers won't let anything stand in their way as they will compete for the coveted world titles. Specs haven't been revealed yet, but the Blu-ray/DVD combo pack will include: Audio commentary with director Sue Bourne and world champion John Carey, Irish Dance Dresses: Interview with costume designer Gavin Doherty, The Dziaks from Chicago, Breaking of the Guinness World Record: Special Footage, and Bonus Story Segments. Suggested list price for this release is $38.98. You can find the latest specs for 'Jig' linked from our Blu-ray Release Schedule, where it's indexed under October 4.